This page is frozen, actual one here. 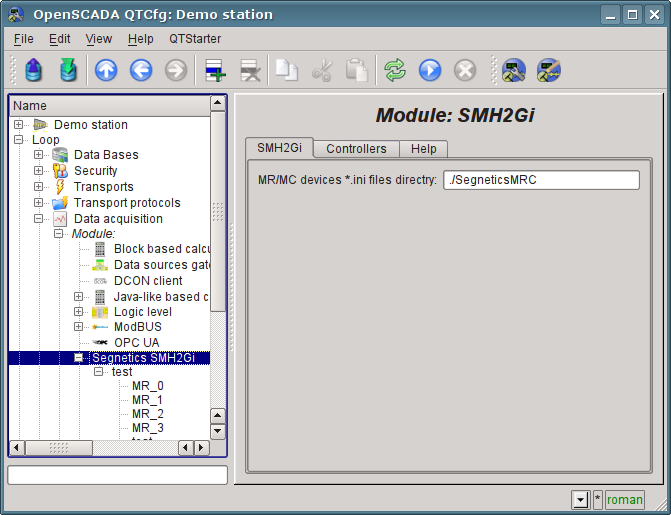 Module "SMH2Gi" of subsystem "DAQ"
Description: Data acquisition and control by Segnetics SMH2Gi ( http://segnetics.com/smh_2gi) hardware interfaces and modules. 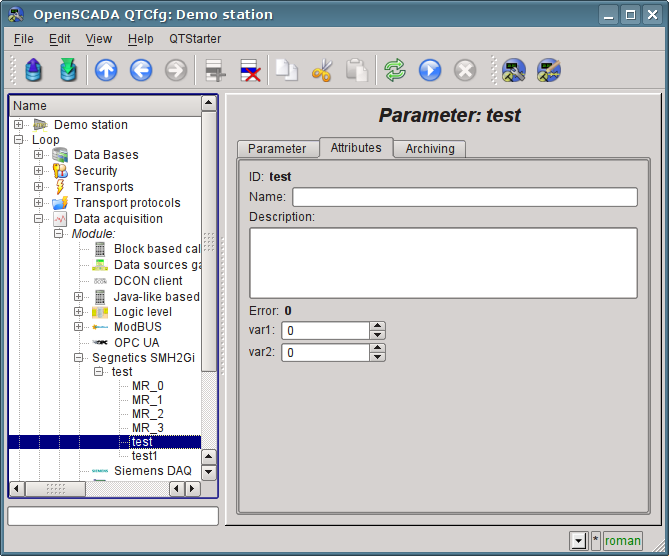 The module provides functions of integration of OpenSCADA system to environment of programming panel controller with OS Linux SMH2Gi (Fig.1) from firm Segnetics. The module was developed for project "Automatic system of control of vacuum technological process" and funded by " The Laboratory of vacuum technologies". The module implementing task allowed on link. 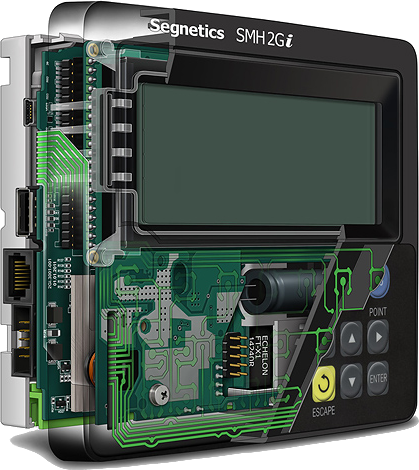 "SMH 2Gi" — programming logical controller, aimed for automation of engineer systems of buildings and technological processes of industry. Enchantment of input-output channels by connection of an adjustment module "MC" and expansion modules "MR". Working into the networks Lonworks and Ethernet. At a new module addition you unneeded for the PLC dismantling and disassembling. It made significant simplify the work into process of a system expanding and configuring. 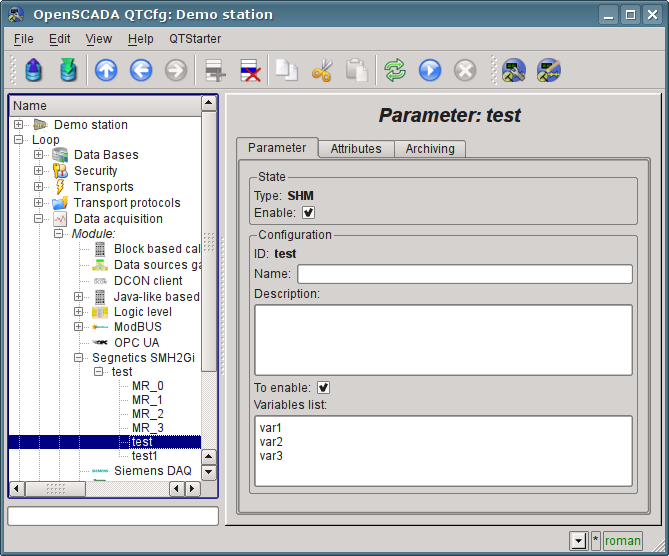 Free programming by the instrument "SMLogix" assistance in addition with the configuring program "SMConstructor" which allow you to create control programs quickly and to adapt it for a concrete object. Full programming compatibility with the controllers "SMH2010", "Pixel" and "SMH 2G". You unneeded for a program re-creation. Possibility to work into networks, built on Modbus and Ethernet into the device's role as Slave or Master. Graphical display, which allow you show different objects of visualization, trends of processes and text of different sizes. Graphical display Type – STN, monochrome 192 х 64 dots; diagonal - 4.1"
Working voltage range For outputs on transistors: 0…36 В DC. For outputs on optorele: 0…36 В DC; 0…25 В (rms) AC. 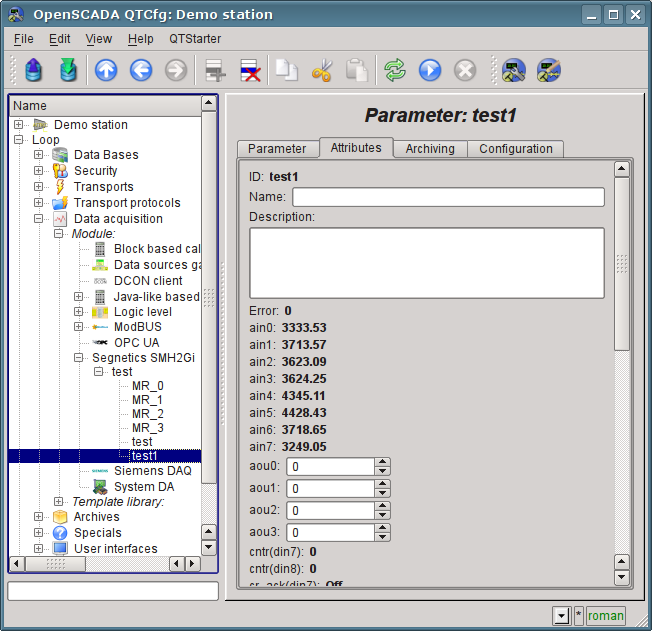 OpenSCADA project assembling for an environment of processor ARM926EJ-S and OS Linux grounds on GCC-4.3.2, Glibc-2.8, Binutils-2.18 and Kernel-2.6.29 was done long enough and it described by link: http://wiki.oscada.org/Using/PLC#h1086-9. But in an exploitation process was is a need of a direct data acquisition from modules "MC" and "MR", and interaction with the original environment "SMLogix". At all we need to note that the original environment of SMH2Gi represent by two processes: "mbs" and "logix". Where "mbs" performs a function of acquisition of modules MC, MR and other interfaces and "logix" performs programs execution and visualization to the embedded screen. On the modules MС and MR configuring to frequent acquisition the process "mbs" can use more then 30% of the processor's resources into the system loading then it is leave few resources to all other tasks, and it mostly reloads the processor. 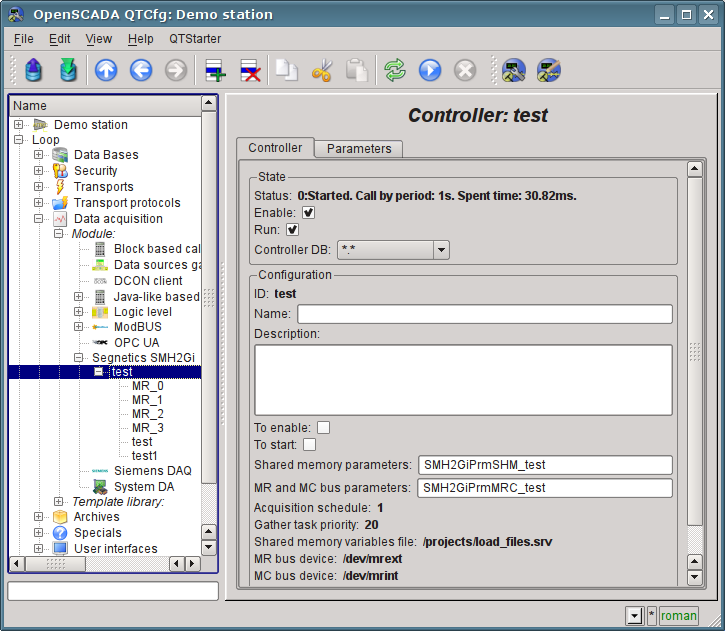 Replacing the process "mbs" (disabled into the file "/projects/start") into OpenSCADA allow you to remove that kind system loading by using function select() of the operation system at work with the serial interfaces. And working with the process "logix" by the shared memory allow you to bypass a problem of a low priority of the network interface. Into this version implemented the data acquisition and the values transmission to the process "logix" by the shared memory, also the values acquisition and transmission from/to modules MC and MR. The module implements functions of horizontal redundancy that is accordance working with a remote station of the same level. To the modules MC and MR working needs a previous initial procedure which must send tune-request, specified to the module concrete model. Next to a data request/send you need an information about the module structure. This kind information is contained into INI-files, per file to the device. Folder with INI-files specified into tab "SMH2Gi" by the module page (Figure 1), and the typical *.INI files archive, adapted to OpenSCADA needs, allowed here. Fig.1. Tab "SMH2Gi" of the module page. The controller's object describes a task of SMH2Gi data acquisition of the two types: "SHM" and "MRC" (Figure 2). Fig.2. The controller's object configuration tab. The controller status, that is: state, "Enabled" and "Started" and DB name, which stores the configuration. Identifier, name and description of the controller's object. Status, in which the controller must to be switched at the boot time: "Enabled" and "Started". Tables name for storing here controller's parameters configuration for types "SHM" and "MRC". Data acquisition task's scheduling policy and execution priority. Variables description file of the shared memory to interaction with the process "logix", which created by the process. Serial interfaces addresses for devices MC and MR. Tries number to requests by a serial interface. Due to the fact that the modules MC and MR needs to previous reset and next send the tune-request then an independent physical connection, disconnecting and also object single module enabling/disabling often impossible without the controller's object stopping and disabling at all. The parameter's object is a direct agent of the data source, in our case this is shared memory and MC, MR modules. Each the type represented into different way. Fig.3. The parameter's type "Shared memory" configuration tab. The parameter status, that is: type and status "Enabled". Identifier, name and description of the parameter's object. Status, in which the parameter must to be switched at the boot time: "Enabled". Variables list of the shared memory for it creation/placing to an attribute of the parameter. The tab "Attributes" example shown into Figure 4. Fig.4. Tab "Attributes" of the parameter's object of the shared memory. The parameter's type "Modules MC and MR (MRC)" uses for access to the modules MC and MR data. 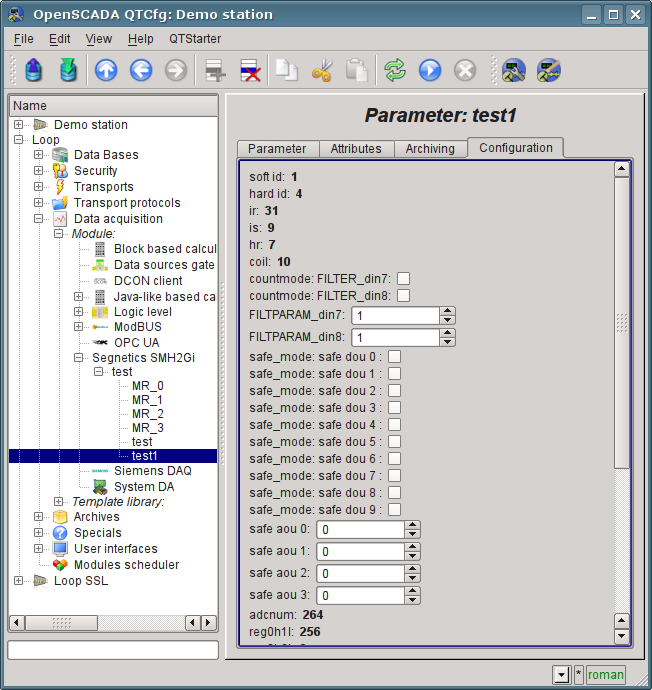 The parameter's object configuration tab of the type shown on Figure 5. The parameter's type is generic for the modules MC and MR by mostly like working with a difference only it's installation bus, that is taken in account by the module address sign. Fig.5. The parameter's type "Modules MC and MR" configuration tab. Module type and it's address on bus. The module type you must set strictly accordance to the physical module installation by the address, elsewhere you will take an error of the parameter's object! The MC module can be single and for one you need set address "-1". The tab "Attributes" example shown into Figure 6. On Figure 7 shown tab "Configuration" which contains all configuration fields of the tune-request and the discrete signals inversion. Fig.6. Tab "Attributes" of the parameter's object of the module MC. Fig.7. 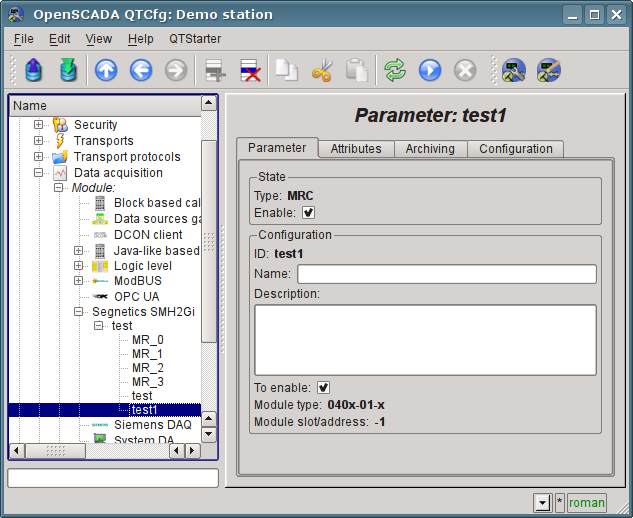 Tab "Configuration" of the parameter's object of the module MC.